Mahinda has launched its much awaited quarter-litre motorcycle, the Mojo in India at Rs 1.58 lakh (ex-Delhi). This is an introductory price from Mahindra and will be valid till this Diwali. The Mahindra Mojo has been simultaneously launched in Bengaluru, New Delhi, Mumbai and Pune and will be available in 10 select dealerships in its first phase. While the first 100 Mahindra Mojos have already been pre-booked through invitation, the bookings have started at Rs 10,000 (some dealerships report the booking amount to be Rs 20,000). The Mahindra Mojo comes with a 295cc single cylinder engine producing 27PS of power and 30Nm of torque with a top speed of 147kmph. It has a long wheelbase and gets a set of Pirelli Diablo Rosso II tyres. The Mojo will be available in three colours- Glacier White, Charcoal Black and Volcano Red. At the launch, Pawan Goenka, executive director, Mahindra & Mahindra Ltd said, "All of us at Mahindra are extremely proud of the Mojo. It has been developed in-house, with inputs from global partners and is designed to be on par with global products in this class. Mojo leverages deep consumer insights to serve many distinct needs of passionate biking enthusiasts. Testimony to this, is the fact that we already have 100 invite based pre-bookings for the Mojo." Rajesh Jejurikar, president & chief executive  Farm Equipment & Two Wheeler Division said, "We are confident that Mojo will be an iconic brand. We are overwhelmed with the response so far from both experts and customers." 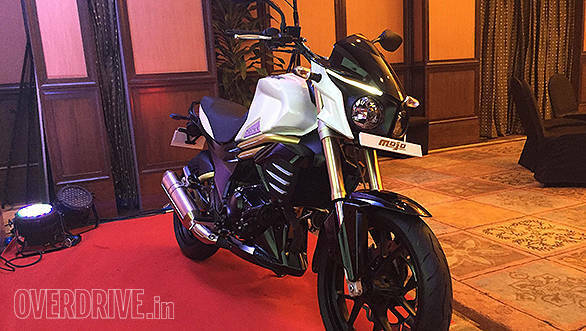 At this price point, the Mojo will compete with the KTM 200 Duke and the Honda CBR250R. We've already ridden and reviewed the Mojo. Scroll down for more stories on the new Mahindra motorcycle. Mojo is a technologically advanced, comfortable and capable motorcycle, and has been launched at a special introductory price of only Rs. 1,58,000/- (Ex-showroom Delhi) The First 100 MOJOs have already been pre-booked by invitation Synopsis:  Mahindra's MOJO aims to set best-in-class benchmarks in styling, performance, and ride quality  A head turner, MOJO will appeal to biking enthusiasts - Bold Styling: the MOJO boasts of predator styling with Mahindra's DNA of being bold, tough and masculine. - Unraveled Performance: It is powered by a 300cc liquid cooled, EFI single-cylinder engine, which produces max power of 27bhp and peak torque of 30Nm. - Superior Ride Quality: MOJO with its large wheel base, Pirelli Diablo Rosso II tyres, inverted front suspension and coaxial mounting of frame, swing arm and engine provides unmatched ride quality.  Launched simultaneously in New Delhi, Bengaluru, Mumbai and Pune. Mahindra's MOJO will be available across 10 select Dealerships in Phase 1  Available in Glacier White, Charcoal Black, and Volcano Red.  Launched at an attractive introductory price of Rs. 1,58,000/- (Ex-showroom Delhi) for all bookings till this Diwali. Mumbai, October 15, 2015: Mahindra Two Wheelers Limited, a part of the US .9 billion Mahindra Group, today unleashed the eagerly awaited MOJO on Indian roads. The technologically advanced 'MOJO' aims to set new benchmarks in styling, performance and ride quality. MOJO comes equipped with the state-of-art engine with DOHC (Double Over Head Camshaft), low friction piston and rings, advanced EFI (Electronic Fuel Ignition), iridium spark plug, resonator fitted intake system and twin exhausts. MOJO uses a twin tube frame with high torsional rigidity, inverted front fork with rigid triple clamp mounting and high pressure gas charged offset rear mono-shox with separator floating piston, largest 320mm radially mounted front disc brakes and Pirelli Diablo Rosso II tyres. These features are enhanced with a 21 litre fuel tank, the largest in its class, to ensure it can cover longer distances on road effortlessly. The handlebar and footrest placement of MOJO offer an upright riding stance which enhances the comfort of long distance riding. MOJO also features Twin Pod Head lamps with LED guide light and LED tail lamps. The fully loaded console includes a digital speedometer with fuel gauge, dual trip meter, and analogue tachometer. The twin-exhaust system is specially designed to produce a unique note. Dr Pawan Goenka, Executive Director, Mahindra & Mahindra Ltd. said, "All of us at Mahindra are extremely proud of the MOJO. It has been developed in-house, with inputs from global partners and is designed to be on par with global products in this class. MOJO leverages deep consumer insights to serve many distinct needs of passionate biking enthusiasts. Testimony to this, is the fact that we already have 100 invite based pre-bookings for the MOJO." Rajesh Jejurikar, President & Chief Executive  Farm Equipment & Two Wheeler Division said, "We are confident that MOJO will be an iconic brand. We are overwhelmed with the response so far from both experts and customers. We are happy to announce the creation of the 'MOJO Tribe', a community of MOJO owners that will ride on exhilarating long rides together." The sales and service experience is also being enhanced by creating a MOJO Zone, a shop-in-shop concept in line with the expectations of this discerning consumer segment. The Mahindra MOJO was launched today at an attractive introductory price of Rs 1,58,000/-(Ex-showroom Delhi). The price is valid for all bookings till this Diwali. The bookings open on 16th October online on www. mahindramojo.com MOJO TRIBE  Club of MOJO Owners Mahindra Two Wheelers also announced the launch of the MOJO TRIBE. This exclusive club for MOJO owners has been created for them to share their biking experience with other like minded owners and also be a part of the upcoming rides called the 'Trails of MOJO TRIBE.' The first of such consumer trails will be flagged off on 17thOctober at Bengaluru. The club will regularly hold rides for owners of Mojo and organize activities that will enhance the biking experience.